Many of you mamas may not know, but Sunday, January 10th was National Houseplant Appreciation Day. What you likely know is that I’m an avid gardener. I love my plants. Mostly I love them because they give me so much love in the form of clean air, beautiful scenery & just taking care of the mother Earth I depend on so desperately. In addition to all that I learn a ton about life through caring for them. Spider plants are well-known for their easy care and for the little tendrils they sprout very easily. In my house we call them babies. Spider plants, unlike many other houseplants, grow their babies as long tendrils with baby spider plants at the ends. 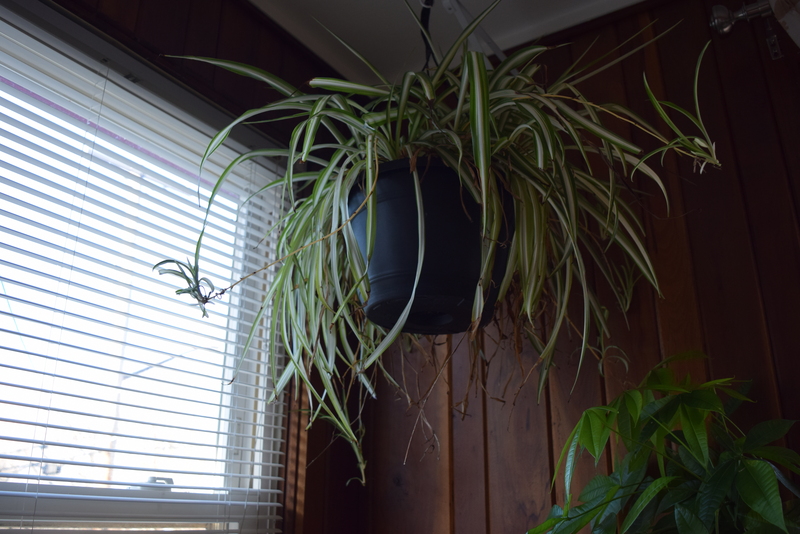 One of the things I noticed about my spider plant is that when it’s not getting enough water or sunlight, the babies began to die before the plant itself begins to wither. As a mom, I thought that rather than the plant sacrificing its children it would wither itself. FALSE. One thing nature understands better than we do is that everything flows from a source. When a source begins to wither everything in its shadow will dry up first. When a stream dries up the coast line is barren first. One of the signs a person is suffering with cancer is that their falls out first. It’s the same concept with motherhood. If moms (the source) are not practicing self-nurturing self-care activities, the outward signs appear first. Their children may be spending exorbitant amount of times in front of the TV, dinner might consist of cereal and oodles & noodles daily, the house may be messy all the time. When mommy is all dried up, no matter how unintentional, the babies will die first. When we neglect to care for ourselves we have the misconception that we can continue to care for our children without missing a beat and that everything will be just fine. That’s simply not true. My Spider Plant reminds me of Black mothers everyday. We shuffle the kids everywhere, we cook for, clean for and love everyone within our reach without ever asking: What do I need today? But, the good news: unlike the Spider Plant, we CAN control how much water we get! Have you been putting off that pedicure? Make an appointment NOW! Schedule that time to sit down and read, NOW! Wanna exercise? On your lunch break today, take a walk around the building, NOW! Stop letting your water dry up. Remember before you whither, the children, your mate, your parents and everything in your shadow will whither first. Make your self-care activities a priority and watch as everything around you begins to bloom. Good luck mamas! PreviousWhy Pittsburgh Brown Mamas Rocked in 2015! Thanks so much. I’m glad to inspire someone else. Being a mom is no easy task, but we keep going. Thanks for commenting. I loved your post on houseplants. You definitely keep me inspired. I enjoy all the information you share. It’s definitely a struggle being a mother & knowing that their are mothers like you can bring a positive change in other mothers lives. Thank you can’t wait to see more posts.